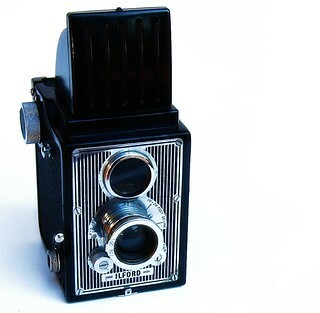 The Ilford Craftsman is a pseudo TLR made by Ilford in the UK, introduced in 1949. The viewing lens is fixed, but the taking lens has continuous focusing, marked in zones (4-5feet, 5-7, 7-10, 10-20 feet, 20-infinity) - and a choice of f9 and f18 apertures. The Everset shutter has speeds of 1/75, 1/25 + B. These two exposure settings are controlled by knobs below the taking lens. There is flash synchronisation, via Ilford's own two-pin connector (similar to the Advocate), on the left side level with the lens. 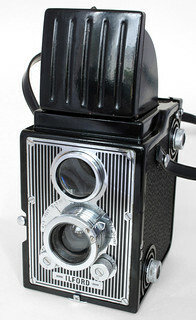 The body is made of leather-grain patterned plastic, with a metal viewfinder hood/cover and a chromed vertical-striped front panel. There is a red window with a cover operated by a knob on the lower left of the back. The Craftsman took twelve 6x6cm images on 120 or 620 film (Ilford designated these films 20 and Z20). This page was last edited on 17 November 2018, at 04:37.